How To Make Money Online ...:::: Earn Methods ::::... How to get verified Paypal Account in Pakistan ? Paypal is not working in Pakistan, because this services in not available in Pakistan. But now you can Verify Paypal in Pakistan to just take a few steps, and you are success to approve your Paypal account in Pakistan. 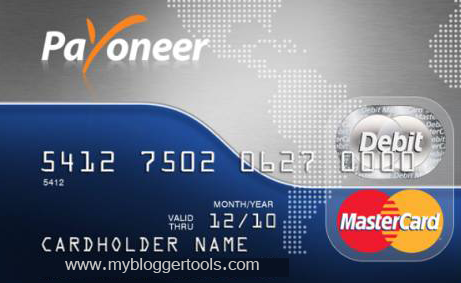 Apply your Payoneer Prepaid Debit Master Card. this card is premium service to allows users to receive and send payments for United States, companies directly to Payoneer Master Card. you apply this card easy to Pakistan and use this card to creating to your Paypal account in Pakistan. so go to apply your Payoneer Prepaid Debit Master Card, click this image blow to submit application. now your paypal account are created. and you transfer funds to paypal to payoneer card. and withdraw your founds to any atm machine in pakitan. you also add your funds payoneer to Paypal. if you require any information about your (Payoneer Card) apply you just drop your message below.